Keep all your beloved jewelries well organized, easy to find, and beautifully displayed with this SONGMICS Jewelry Cabinet. 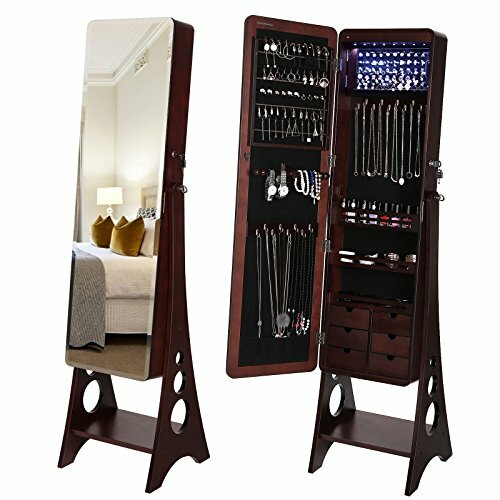 Use the full length mirror to check how stylish you are while saving the trouble of going to the nearby cheval mirror to make up. Open the mirrored door to reveal a variety of storage areas for your gems and jewels. LED lights turn on automatically every time you open the mirror and they will make your valuables classy and luxurious in look. Different from regular modern slim hooks, this jewelry armoire features retro thick hooks, sturdy enough to hold lots of necklaces. Whatever type of jewelry you have, there is a place to accommodate it. No need to search for the loosing earrings or untangle the mixed up necklaces anymore! Clear partition enables you to see all your items at a glance, making daily dressing up a quick process on busy morning. Chic in design and delicate in detail, it's such an amazing gift for birthday, Valentine's Day, Mother's Day, Thanksgiving and Christmas! - Please remove batteries when the LED lights are not used for a long time. - Please keep accessories away from children during installation.